So I was on Twitter earlier today, and noticed my followers had grown exponentially. "That's bizarre," I thought. I was hardly on Twitter yesterday because of meetings and happy hour -- and I don't like to Tweet when under the influence. Tried it once... bad idea. "10 Twitter Users Who Deserve Attention"
Lo and behold... in between two PR experts and successful professionals... is little 'ol me. I was blown away by this. I think I turned three shades of red when I first saw it. How can I possibly be in a top 10 list of people who deserve attention? And check out the others on the list... PR experts, started their own companies, run an independent radio station... They have upwards of 900 followers (compared to my 185) . Don't get me wrong though..I'm completely and overly honored and slightly amused that I was chosen. The author, Scott Hepburn (@ScottHepburn), is a follower of mine on Twitter and I follow him as well. I asked one day the value of using Twitter at a Power Company and offered some suggestions as well. It did generate some interesting conversations and some ideas that I have presented to my public affairs co-workers. I actually helped a customer (@cophotog) out on Twitter just this week and thought it was a great example of how Twitter can benefit customers and the companies who serve them. So what now? I feel a little bit of pressure to try and live up to my selection...but I guess I was selected for being me -- so I should continue to just be me, right? Cartoons By Michael Ramirez; taken from IBDeditorials. First they came... my version. And then . . . they came for me . . . And by that time there was no one left to speak up. It's a slippery slope people. Looks good, and after five days it still hasn't been stolen. :) Although I had a nail in my tire today -- related?? Just kidding - most likely not since the ballet studio I take class at is surrounded by construction right now. I'm so often confused, and have said so before in blogs, that all this information is readily available with facts and things that are true and yet people still 'drink the kool-aid' as O'reilly puts it. It's frightening to hear things on talk radio that the media blatantly ignores and is unwilling to investigate. I've watched people who are typically mild mannered and not the least bit interested in politics become these brain washed, hate spewing, radicals... it's not even about the issues anymore.. it's about accents, and someone's children, their clothes, and age...and it's scary. No one will take the time to investigate history, to learn the truth of why we are in an economic crisis in the first place. "It's all Bush's fault...it's all his doing." No one seems to acknowledge that we've had a Democratic Congress for two years? No one seems to acknowledge that people started getting loans they never should have had because of things that happened during Clinton's presidency. It's all spelled out for us in facts from the history books and yet no one wants to learn the truth -- they just want to blame the president. I don't get it?? And I'm upset with McCain's campaign... I'm upset. It should have been easy to run against Obama.. it should never be this close. Yet they tiptoed around issues because they were afraid to be labeled as running an unfair campaign and attacking Obama... well guess what? They are attacking you AND saying that you're attacking him anyways, so you might as well hit him where it hurts! It's like America is falling for one giant marketing campaign. Obama is a brand. He coined the word 'change' and 'hope'. He has a freakin' logo for goodness sake. It was a genius marketing campaign, with billions of dollars. Nothing more. Just do a Google search for Obama ad campaign spending and get an idea of the millions he pays for one 30 second ad. And people want to attack someone for spending $150K on clothes for a campaign, that will be donated afterwards anyways? Millions for 30 second ad. And people just googly eyed bought into it. And yet, no one knows anything about this man...what he's done or his issues -- again with my Obama experiment. Turns out I'm not the only one who experienced this. Please, please, please... if you have time on your hands, check out this link. Yes, it's long...yes it's lengthy, but it is factual and has the video evidence to back up every claim. If you have even the slightest doubts about the candidate you are voting for, PLEASE spend an hour and read through this site. Get the facts... not campaign talking points. Quit drinking the Kool-aid people. So, I hate to admit this, but I've been waiting for this commercial to finally make its way to YouTube. Generally, I'm not a big fan of the Stride gum commercials...but for some reason the commercial with the Germans in lederhosen just makes me smile. Maybe it's because I'm German...or maybe because it's just one of those 'it's so stupid it's funny' type humor. Regardless.. it speaks to me... but not enough to make me buy Stride gum. Oh well. With only 2 weeks left, I ordered my sign. Lately, when I go walking, I usually go across Rosewood to Shandon because it has sidewalks and it's a little more populated with other runners and walkers. Well most of the houses on that side have Obama signs. There's even a house with a sign hanging on a tree (I really need to go snap a picture) that says, "Jesus was also a community organizer". And the worst part is that they have a spotlight, like the kind you use to spotlight Christmas decorations, positioned in front of the tree shining on the sign. Are you kidding me? 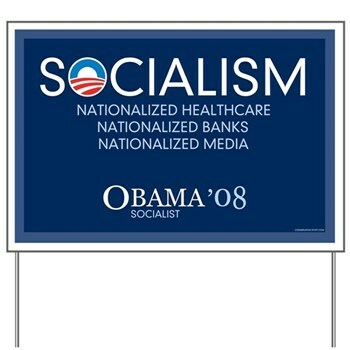 Just points out the fact that Obama's 'messiah' image is rampant. Can you imagine the media backlash if someone compared McCain to Christ? I think it's so sac religious. You can love Obama all you want, but don't compare him to Jesus please. 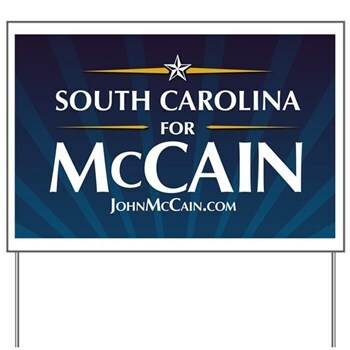 So I almost bought this sign below..but I figured I already overspent on my McCain sign..wasn't worth it to get the other one for only two weeks. I'm actually thinking of printing it out on paper and sticking it in the person's mailbox. Also, I almost bought even another sign. Changed my mind because again I got scared my house would get vandalized or broken into...but the message is so true..
And I actually wonder if I'll have to worry about my sign getting stolen... I actually saw a blog post by a local political blogger, Wesley Donehue that was pretty funny about signs getting stolen. Picture below is from his blog. That's pretty funny! I don't know if I have the you know whats to do that...I need to go get a gun so I can cling to my religion and my gun. Right now I'm clinging to my religion and my mace and knives. Palin on SNL earns show highest ratings in 14 years. And NBC is hilarious...of course they would have a preview for the W movie right afterwards - you know the movie they made to make fun of George Bush, with the actor that doesn't even look remotely like him. "Spread the wealth around." Socialism at its best. Wake up people please!! "Spread the wealth around." That's socialism! What happened to the American Dream of working hard and gaining success and EARNING your wealth? Basically Obama wants to take money from those who worked hard (like this plumber) and give it to people so they can skip the hard work part. That's the kind of change you want? This is not Robin Hood. Robin hood stole from the government, the Sherrif who was unjustly taxing. Sounds like Obama is the Sherrif more so than Robin Hood. If anyone's Robin hood it's McCain and Palin -- cutting government spending and earmarks so American's pay less taxes! Why are people not seeing this? I feel like it's so obvious. I don't think I've reached my limit when it comes to success... I plan to continue to work hard and hopefully see success in my carreer and hopfully that comes with a bigger salary.. why should I be punished with more taxes for working hard to get to that position? Why would anyone work harder at what they do if they are getting rewarded for low income? Look, the government is not here to babysit us and to hold our hands as we make our way through life. Life isn't fair. Life isn't easy. Life takes hard work. Sure, some people aren't born into the best situations, but how many stories have you heard of people rising above their situation -- working hard and making themselves successful? Shoot, Obama himself constantly reminds us of how he came from a poor single parent home. Look at him now! Running for president, two books under his belt. He didn't get hand outs, did he? Government is not a charity. There are hundreds of charities that people donate to. There are churches and volunteers that help those that are needy. What will happen to large charities when their taxes go up? What will happen to their wealthy donors if all of a sudden they are taxed heavily? And lastly, how can you ensure that this redistribution of wealth (communism..cough.) will really go to those who are really in need? This scares me. And I'm sorry, most of you who are voting (not all of you, I said most) for Obama don't even know why! Ask yourself... do you really know Obama's tax plans? Do you really know where he stands on all the issues? OR do you just like the way he speaks? the trendiness of voting for him? When you ask Obama supporters why they are voting for him, they can't articulate why -- they just say bad things about McCain and Palin, talk about 'change' (marketing victims), and say he's a great speaker and has a great air about him. I said this in another post..and I know it's bad...but historically true no less... Germans also felt the same way about Hitler. They had no idea what his real beliefs were, but they were awed by him..by his stature and his oratory skills. So if you are voting for Obama in three weeks, please please, ask yourself -- why? Are you voting on the issues? Do you really even have any idea what kind of 'change' you are actually voting for? For starters, take my Obama test I mentioned in this blog post. It's about mid way down, a little closer to the end. And try it on a few of your fellow Obama supporters. If you can answer both questions without looking it up on Google or hesitating, then by all means, vote with your beliefs and vote for him. And if you can't answer both those questions without turning on MSNBC or using Google, or asking your hip 'political savvy' friends...then you should be just as scared as I am. I don't know when this trend started, or why it started, but I'm writing you to let you know that the thick bands at the bottom of dresses should no longer be included in your dress designs. The thick band at the bottom that hugs at our thighs is neither attractive nor flattering. It baloons the dress out right at our hips -- most women don't need any help with volume around the hips. Also, the style accentuates the buttocks area, another area that most of us don't want the extra volume of fabric. Please do away with this unnecessary trend and leave dresses to the more traditional, free flowing style. I'm not a fan of babydoll dresses, but I tolerate them. I've never been a fan of the bubble skirt, but I own a few bubble dresses. However, I have never come across a bottom banded dress that flattered me (or anyone else for that matter) in a positive way. Most men surveyed will agree that this style tends to make skinny girls look ten to twenty pounds heavier. So Mr. or Ms. fashion designer -- quit ruining potentially cute dresses by adding the thick, spandex band around the bottom of it. Sincerely, A fan of the classic summer dress. Example dress pictures from Web sites Forever21.com, WetSeal.com and Mandee.com. So I just saw an old Pizza Hut commercial from at least three years ago. I wonder if because of budget cuts and companies starting to not renew contracts with expensive ad agencies if they are starting to reuse successful ads from the past. I actually think it would be a smart concept to bring back some nostalgic ads. Another commercial I would love to see make a comeback is Max Headroom... wow, after watching this again, he sounds and acts just like Jim Carey! Obama in a Nutshell - literally. I watched the debate tonight and I wasn't really impressed with either candidate. I think McCain did slightly better, but nothing new was revealed by either candidate that we didn't already know. I just don't think these political type interviews and debates are really a way of determining who is qualified to be President of the United States. I really think it's about the issues and the track record the candidates have -- the experience. The debates and interviews just remind me of pageants -- how beauty contestants will tout that pageants are for scholarship and then prance around on stage in bathing suits and be judged on things like 'poise' while walking around in a gown that costs more than the 'scholarship' you win. And I'm allowed to say this because I've been in two pageants -- one was judged by Carpet store owners, and the other I was asked by the judges 'If you were deserted on an island, what three things would you take?". Because that's the most important question to ask a female in a male dominated, hardest major at Clemson contestant. Because evidently what three items I would take on this so called island could change the world! Maybe they should ask the presidential candidates beauty pageant questions? Do you get that same feel when watching interviews and debates -- it's like why does this even matter. Shouldn't we all, as responsible Americans, read and research and know the issues and where each candidate stands on the issue -- and vote on how our beliefs line up with that candidate? Instead of focusing on their funny accents or funny names? I still think that the voting machines should be set up like a survey, where you answer questions on the issues and then the machine will vote for the candidate that most closely aligns with your viewpoint. That way, you're not voting on someone because it's the 'trendy' thing to do or because they wear an American pin. Which leads me to a funny comment a fellow Twitterer posted earlier in debate "@caseyboyle5 John McCain is so tough, he wears his flag pin on the inside of his shirt, through his skin!" So back to the original purpose of this post -- wanted to share a link someone sent to me that shows Obama's ties to what's going on with ACORN, Freddie Mac, and Fannie Mae .. and his cronies. Pretty interesting stuff that I don't think most people know and that the media won't touch - http://justsaynodeal.com/acorn.html. I have to get back to watching FNC now -- Fred Thompson is on... my original choice for President, until he dropped out of the race shortly after our primaries and my vote. Sigh... Sometimes I wish I wasn't so opinionated and passionate about politics... I get really worked up and exhausted, emotional and depressed. Is being an informed voter worth it? So, back in June, I created a 'To Do' list (because I'm a list person) of things I needed to do around the house, in my yard, etc. this summer. I think I might have done maybe two out of twelve things on the list. Granted I've always got some sort of plans going on during the weekends, but I still have a decent amount of time when I get home from work. I usually go to work, then go to ballet, run on my elliptical, or go walking around the neighborhood -- then I come home and have a good number of hours until bed time. So why am I not productive and completing the items off of my 'To Do' list? Well, after a co-worker and I got into a conversation about our TV habits, I realized that perhaps my TV watching has gotten a little excessive. And thanks to my DVR, I can watch them all. Do you watch this much TV a week also? So I'm sure I'm even leaving some out... No wonder I can't get anything done when I'm at home. If each of those shows is about 45 min. (minus commercials -- which I always forget to fast forward, btw), then that's 1035 minutes, which is about 17 hours per week. Divide that by the four days (Friday doesn't count) and that's almost 4.5 hours a night. Yikes. This makes me think..why am I spending $10 a month for a Blockbuster online membership? ?